Join thousands of students, parents, teachers, partners and college access professionals from across the nation to celebrate GEAR UP and the successes of your hard work and dedication! National GEAR UP Week is an opportunity for you to raise awareness in your community about the positive impact GEAR UP is having locally. It’s a time to engage all your stakeholders – local, state and federal elected officials, funders, partners, as well as local, state and regional media – to share your program’s accomplishments and to get them more involved with your services to students and families. Let’s commemorate your hard work and the progress our students are making towards achieving their life-long dream of going to college! We encourage you to use the resources below to plan and prepare for 2016 National GEAR UP Week. Planning for National GEAR UP Week–A quick overview of GEAR UP Week with some tips and suggestions that will help you succeed. 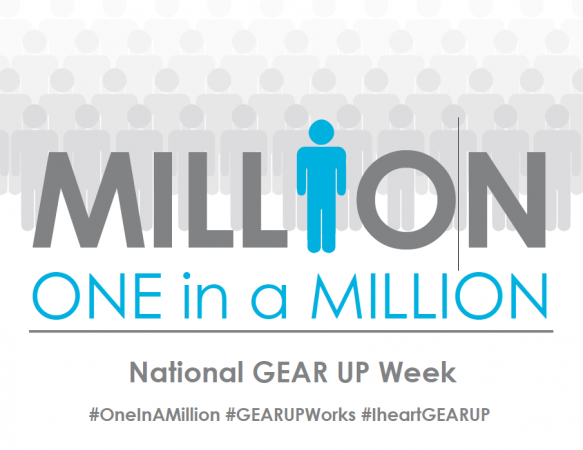 National GEAR UP Week Activity Cheat Sheet – Looking for inspiration? Look no further! Here are a number of tried and true activities to help get you started! National GEAR UP Week Planning Exercise– Use this quick exercise with your team to define your goals, audience, and get to planning! National GEAR UP Week Planning Questions – Pose these questions to your team, partners, students, parents and/or volunteers to prompt good discussion and strengthen your planning. Working the Media for National GEAR UP Week (2013 Webinar) – This webinar offers a simple 4-step process to help you with your media outreach efforts to get coverage for your National GEAR UP Week celebrations. Get ready for National GEAR UP Week! (2013 Webinar) – Watch this 30 min. webinar recording for tips and ideas on how to plan and prepare to celebrate GEAR UP Week. Proclamation request template – Use this letter template to request a proclamation for National GEAR UP Week from your Senators, Representatives, Governor, Mayor, Councilmembers, etc. Proclamation template – Attach this proclamation template to your proclamation request to save you time! Student letter to Member of Congress – Use this letter template as a guide to encourage your students to share their GEAR UP successes with their Members of Congress! Media Advisory – This template is to notify media outlets in your area to cover the event you are hosting. Media advisories are distributed ahead of the event so that outlets can schedule and plan to cover your event. Press Release – This template will help you create some “buzz” about your event. You can send it out before or after the event takes place, just make sure you edit it accordingly! Op-Ed: Guidelines & Talking Points – Op-eds are a great way to raise awareness about GEAR UP at the local and regional level. Follow the tips and use the template in this resource to submit your op-ed to your news outlet.